Don’t get stuck on a career path you have no passion for. Don’t waste your intelligence on something that doesn’t really mean anything more to you than a paycheck. Let Isaiah Hankel help you define a focus so powerful that everything in your life will be pulled towards it. Create your purpose and change your life. Be focused. Be fulfilled. Be successful. 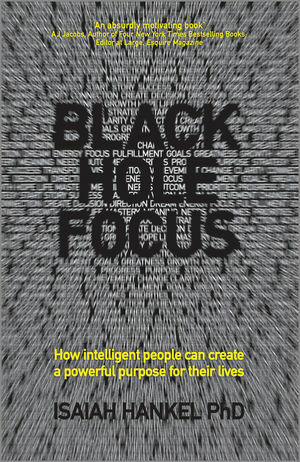 Black Hole Focus has been endorsed by top names in business, entrepreneurship, and academia, including 4 times New York Times bestseller AJ Jacobs and Harvard Medical School Postdoc Director Dr. Jim Gould. The book is broken up into 3 different sections; the first section shows you why you need a purpose in life, the second section shows you how to find your new purpose, and the third section shows you how to achieve your goals when facing adversity. Black Hole Focus includes exclusive case studies from medical practitioners, research scientists, lawyers, corporate executives and small business owners who have used the techniques described in this book to achieve massive success in their own lives. Dr. Hankel is an internationally recognized expert in the biotechnology industry and prolific public speaker. He's given over 250 seminars in 22 different countries while working with many of the world's most respected companies and institutions, including Harvard University, Oxford University, Roche Pharmaceuticals, Eli Lilly & Company, Baxter International and Pfizer. Dr. Hankel uses the science of purpose and the principles of entrepreneurship to help people achieve their biggest goals. Isaiah Hankel is a scientist, entrepreneur and personal development coach. He has been simultaneously advancing a career in cellular imaging and cancer diagnostics with a career in personal development and business coaching.